So, this was a good year. I haven't scanned every photo I took 'cause that just takes so much time. Here are the highlights! Sorry if you can't handle tables, but it was the best way to keep the photos organized and neat. The photos are all "clickable" for getting a slightly higher-resolution copy onto your screen. They are a mix of pictures that both John and I took. If you look carefully at the source for each photo, you can tell who shot what. Not much organization to all of this, either. If you see stuff that you want to tell me about - like if you know someone's name that I forgot, or if you want to tell me that my commentary is pretty dumb - go ahead and send me mail. I love getting email. If you would like to send my brother mail too, then by all means go ahead. Like me, he's a mail junkie. 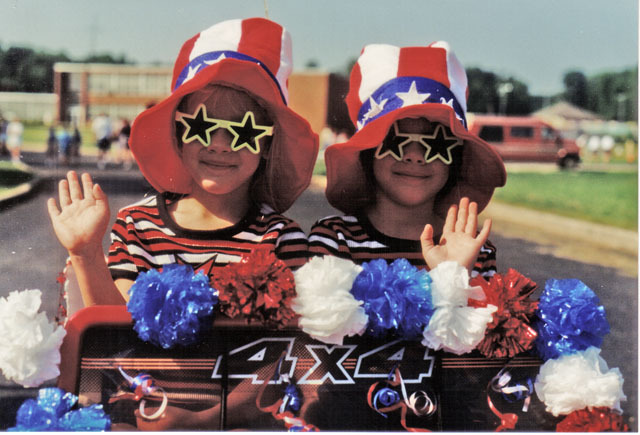 Upon exiting the Parade (no pictures from the parade 'cause, gosh, we were too busy just being in it!) 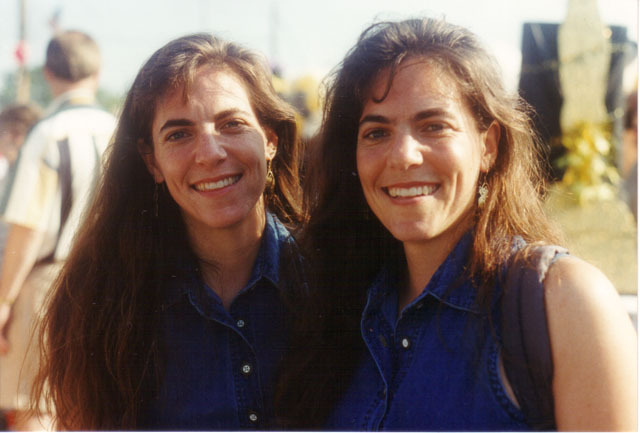 we stumbled across the "how to burn out batteries at a phenomenal rate, while making almost no headway" twins. They seemed to be having fun. Of course, it was still early in the day and those hats hadn't had a chance to heat up in the midday sun. If anyone knows these kids' names, please send me mail! 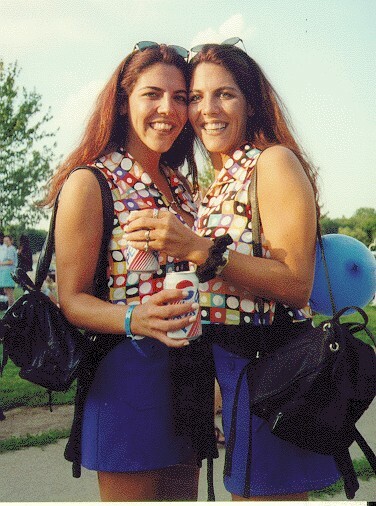 We happened across a fair number of twins who had heard about this whole gig from my brother's homepage. Because there are just so gosh-darned many people there (almost 3,000 sets again this year), some of them we only bumped into at the last minute. On the right: Joyce and her sister Janine (here for their 2nd year!). 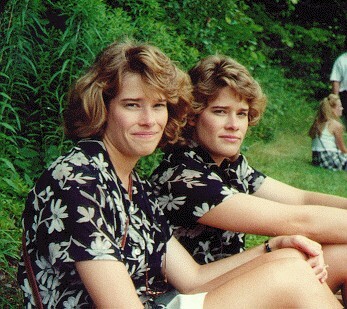 On the left are Marilyn and Carolyn. Thanks to an alert Deanna Fredericks (Marilyn's daughter - STUNNED to see her mom on the Web!) who clarified the names!... Y'know, I've got them saying their names on videotape, and I still can't understand it. Guess I'm getting old. By now you may have noticed that everyone is dressing more or less alike. Strange, you say? Kinda goofy even? Well here's the funny part. John and I absolutely HATE being dressed the same for most of the year - lots of twins are like that, I've found. 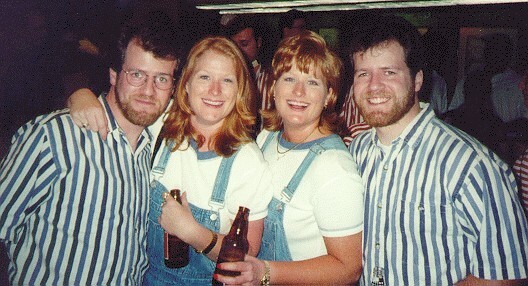 However, come to Twins Days without matching outfits, (even if you're fraternals!) and you'll quickly feel silly wearing different outfits! 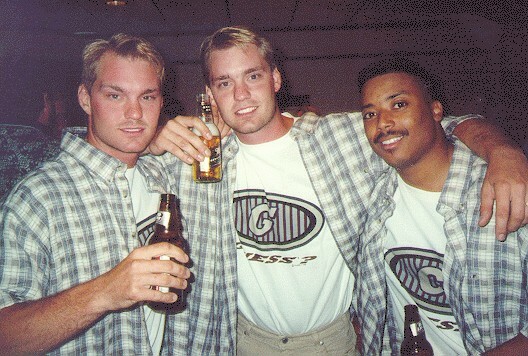 Here on the left, in no particular order ('cause I don't remember - Yikes! 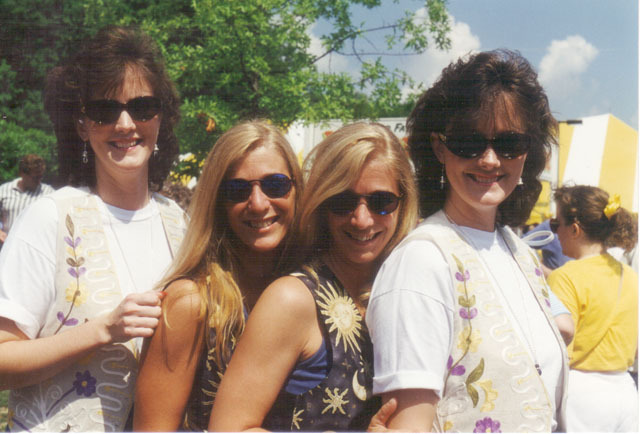 ), are Jean and Jill from Jersey (I just like saying that 5 times fast) flanked by their good pals, Angie and Gigi from Georgia. Never a dull moment with this foursome! 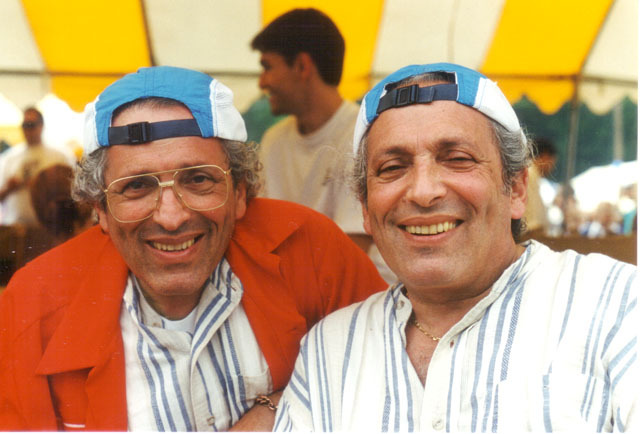 Every year, from all of the twins who "pre-register" (registering by mail well in advance of the festival), a pair of Kings and Queens are randomly selected. 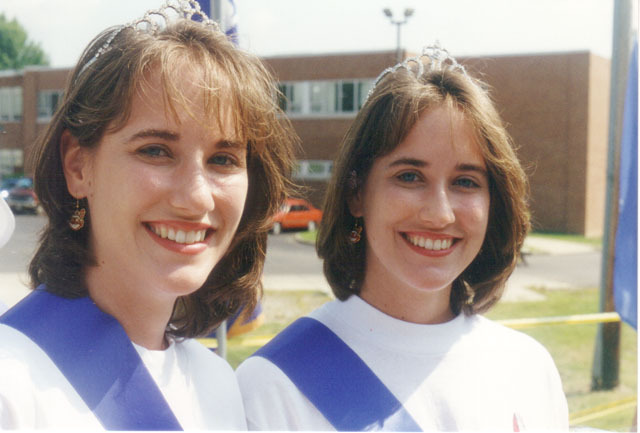 Here on the right are the lucky winners - well, okay, just the Queens - from 1996: Heather (Rapp) Reser and Leslie Rapp . They've been coming almost every year since 1976! 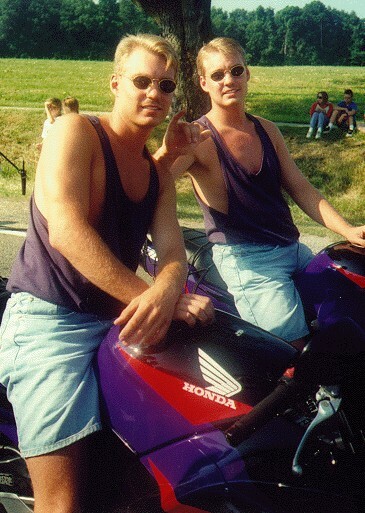 (With just one year missed - 1993 - due to an Aug 7th Wedding. What were they thinking?!? They KNEW that early August was already scheduled!) They get to keep the tiaras and everything! Register now, and you may get your chance to be queen for a day! "Hey!" you're thinking to yourself. "How come no triplets or quads?". Well, any multiples are welcome, and they don't even have to be identical. 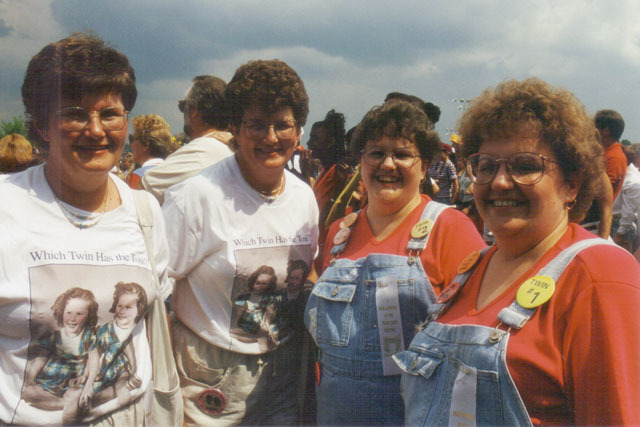 Here's a set of triplets who make the trip (heh heh) every year from Lima, OH. Sure, one of 'em's married, and another one has a name which doesn't match - but other than that, I'd challenge you to tell Jeremy, Josh, and Melvin apart! As of today (11/3/96) word is that Melvin now has a homepage! I'm shocked... SHOCKED .. to hear that there has ever been any drinking at this event! Actually, there is a beer garden at the festival almost every year. Some spontaneous entertainment manages to occur slightly off of the official grounds (in Hudson, OH). 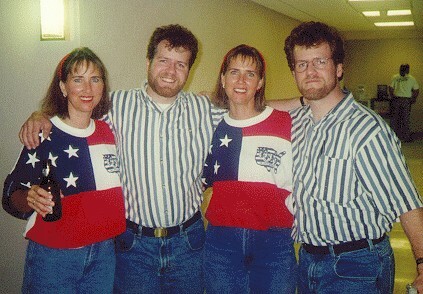 This is John and myself with Sandy and Brenda. Sandy is from Minneapolis (hey, so's my brother!) and Brenda is from Kansas City, KS. Rachel and Ruth made their trek out from San Diego for the first time this year. Handled it like a couple of pros - notebooks in hand, surveys going out left and right for all the other twins to fill 'em in on their "twin experiences" and the like (whoops, haven't mailed mine back yet). They even had a business card! And Email! 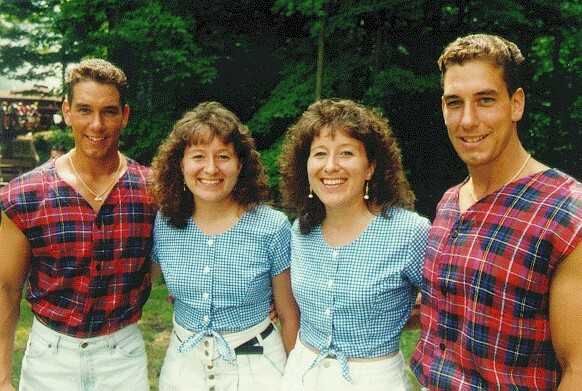 Appearing for, I think, the 6th year (same and John and myself) are Kristy and Lisa, both from Indiana. It's only fair to mention that, in addition to fun food, good company, parades, and artsy-crafty stuff, there are also contests. Some of the braver types come out all decked-out for the competition. The cooks here are Jeff and Steve Nagel. It's great to see these guys every year - they're full of the spirit which makes our annual trek to Ohio a real treat! Every year, as I'm taking the pictures left 'n' right, I swear that I'm going to take such a good set of notes that I'll know who's who in each of my pictures. Each year, I fail miserably. Thanks to recent communications with Myle and Myan (see the shot directly below!) 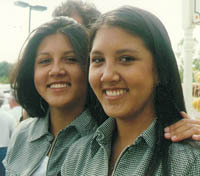 , I'm told that these women are Brooke and Bianca Camp - from Florida. Nice to have them identified! More "not-practical but nice-looking" outfits. MyLe Paulette and MyAn Zagorsky, from Lorain, Ohio, were definately in better form than John and myself. 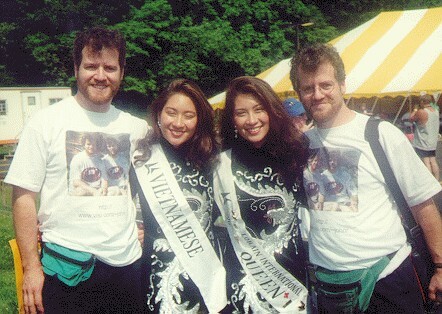 The banners are from their stint as "Vietnamese Princesses" in the 1995 Lorain International Festival pageant. The downside of these outfits? We could sit on the ground and eat greasy Gyros sandwiches without fear..... not sure if they could. Both are starting school at Ohio State University this fall. Celebrities? We gottem! 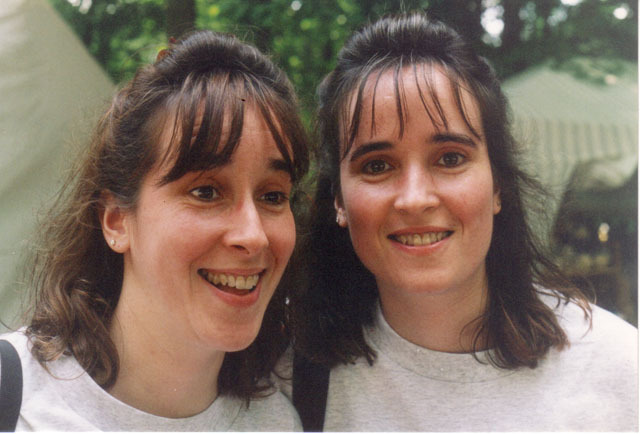 Here are the mile-a-minute-speaking Lisa and Debbie Ganz from New York. 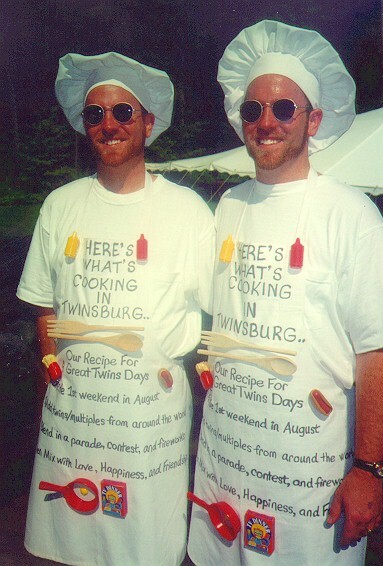 Perhaps you've heard of their TWINS restaurant in NYC (and now Toronto!). Always fun to bump into these two. Someday they'll have a web page - but in the interim, if you and your twin want a job "waiting" at one of their two joints, drop em an email right here ! More cavorting about in the halls of the Holiday Inn in Hudson. John and I had decided that 2:00am was late enough for one night, so we left the bar. Of course, we bumped into some more people on the way to our room - this is us with Peggy and Patty from Jasper, Indiana. About an hour later we had a picture taken to document the new friendship. THEN we finally dragged our weary bods to bed. Had to get up for the 9:00 parade the next day! 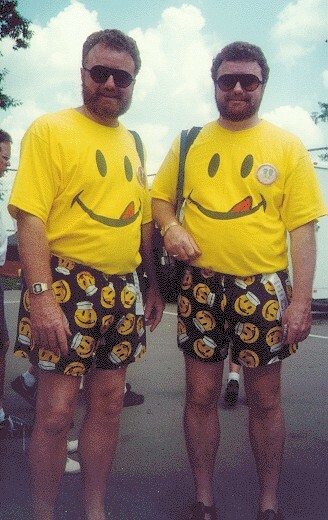 Hey, how can you go wrong with smiley-faces all over your body? This foursome entertained a few of us by the talent-tent for about 15 minutes, attempting to put together some sorta gymnastics show. They weren't successful, but we were amused in any case! The gentlemen are from Chicago - Nick and Jim Falco - and Becky and Laura are both from Pennsylvania. My thanks to Leslie Rapp for fillin' me in on the names! These guys are lucky enough to show up twice on this page, due to the fact that they looked completely cool riding matching CBR600F2's. Melvin was made to walk the whole parade route while these guys relaxed behind the handlebars (and watched their temperature gauges reach for the sky as they puttered along at about 1/2 mile per hour for an hour!). Watch for Mel on his own two wheels next year - seems he just got his own (non-matching... too bad!) FZR600 this fall. Lookout!!!!! Kathleen and Helen from Brooklyn have been coming for a few years.... John and I showed 'em where to park close to the parades without having to pay or take a shuttle bus. One of these days we're going to get back from the parade and find our cars towed. I can let the parking secret out, now. It's by the bank located kitty-corner from the main square. They patrol the lot now, so for the first time in 7 years, we did NOT get to park there in 1997. Nuts! There are some guys John and I always bump into each year, even if only for a moment. These two guys are two such people. If you look closely, you can see me in their shades. More "net-twins"! 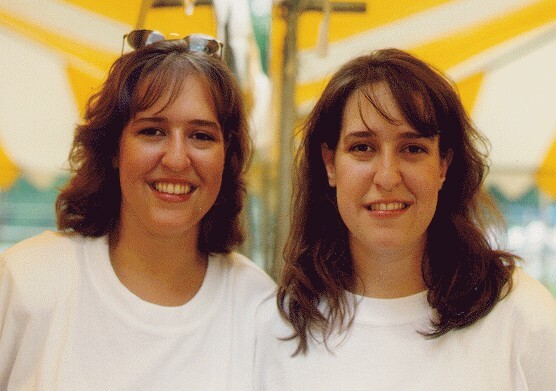 Kristal and Kelly (from wonderful Iowa) noticed John's web page and made the decision to come over to Ohio and check out the "Twins Days" scene. 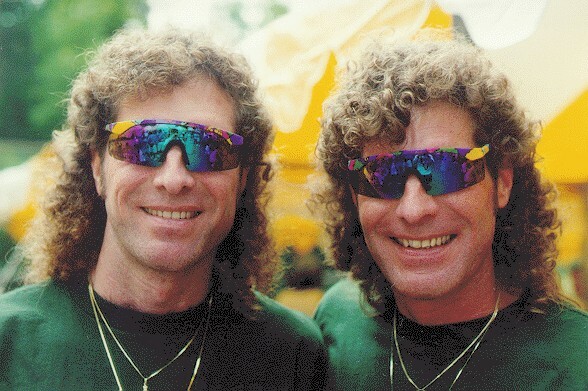 As John and I were wearing T-Shirts with his web-page photo on it, we were frequently accosted by complete strangers with "Which one of you is John?!?" from across the rooms. After being spotted by these two, we had to take a photo to share the moment. Kristal and Kelly were also a couple of the many participants in what I hope is the 1st Annual (unofficial) "Twins Days 1st-borns vs. 2nd-borns Volleyball Challenge". 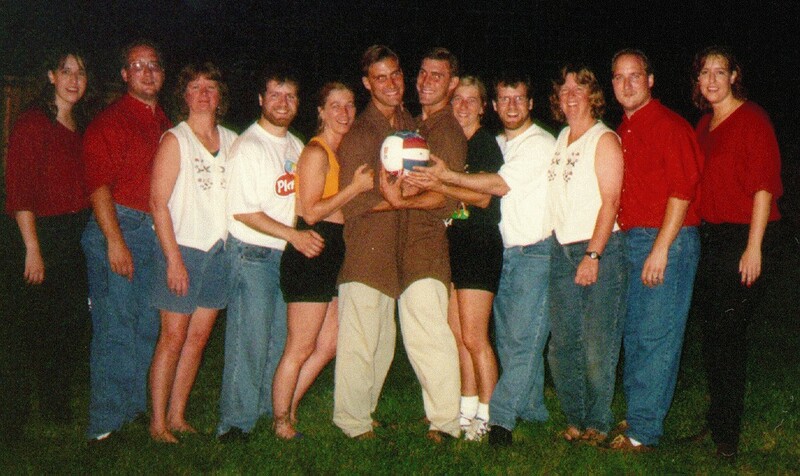 Okay, I've mentioned the volleyball. After much entertainment with "hotel-room-volleyball" (and after many many lightbulbs), we decided to "take it outside". A hearty match ensued - picking teams was no trick. The first round was rather informal, the second a bit more organized. Here we are after set #2. Us second-borns on the left are savoring their 1:30am victory on Saturday night. After a few of the more sensible ones sacked out for their beauty rest 'round 2:00, a final grudge-match was roused up at about 2:30am. I missed that one, but I hear that the first-borns were finally victorious. Jean 'n' Jill, don't forget the ball next year!